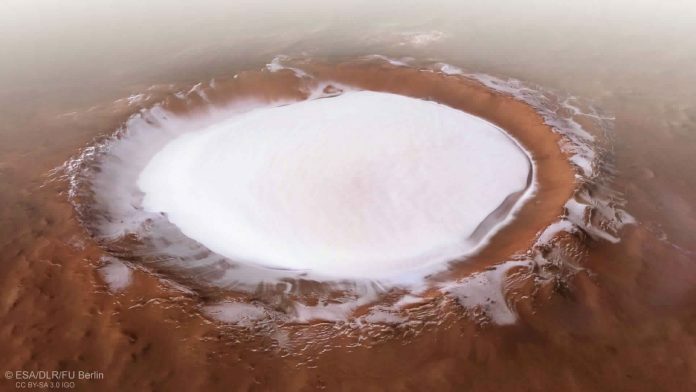 The camera aboard the European Space Agency’s Mars Express orbiter captured a large patch of fresh ice near the northern pole of Mars. The Korolev Crater is imaged as a composite in the picture, with five different long images that have been combined to create a full view of this feature filled with ice, not snow. The crater is 2 km deep and acts as a ‘cold trap’. It captures air moving over itself because the ice causes air to cool down and sink. This cold air sits on top of the ice, insulating it from any warmth outside. ESA has more details. Well, ‘soon’ meaning in about 300 million years. It turns out that the rings are relatively new in astronomical terms — they formed just around the time dinosaurs started walking on earth, a few hundred million years ago. They have been raining water on Saturn for a long time as well, while simultaneously replenishing themselves from sources like icy volcanoes on Saturnian moons, the New York Times reports. The crests on top of peafowls’ heads are not just for adornment — they act as tuning forks during courting rituals. Scientists have discovered that when a peacock shakes its tail in its trademark fanning fashion, the peahen’s crest feathers vibrate with the same frequency. It turns out that the peacock feathers vibrate 26 times a second and produce a rattling noise with a pressure wave, which the female crests pick up and shake along to. The Atlantic has details on how this study was conducted and simulated. EnviroBuild, a sustainable building material firm, bid on a charity auction to raise money for the conservation initiative Rainforest Trust, and earned the right to name a newly-discovered amphibian in Panama. The company decided that the blind, burrowing amphibian, which is at the threat of extinction due to climate change, is to be officially named Dermophis donaldtrumpi, a ‘tribute’ to US President Donald Trump’s attitude towards the global phenomenon. The scientists who made the discovery have seemingly agreed to name it so. More on The Guardian. New high-resolution images from satellites are capable of detecting looting and damage in archaeological sites across the world. Observations showed that even among places with high security, such as remote and secure areas in China which the study observed, showed consistent and expensive looting. The eyes in the sky are expected to help provide better mechanisms to ensure protection to artefacts and tombs. Phys.org has the details.